The Wits chapter of Amnesty International has relaunched their #WorthBleedingFor campaign indefinitely. 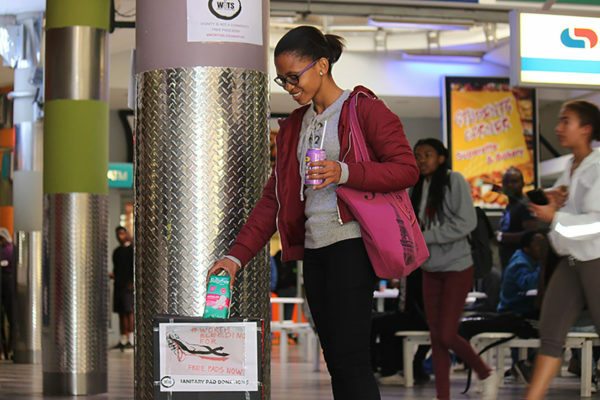 Witsie Kebuile Moseki donates a packet of sanitary pads at the #WorthBleedingFor donation box in the Matrix. The Wits chapter of Amnesty International is partnering with other Wits societies and civil society organisations to relaunch of their #WorthBleedingFor campaign, with the aim of improving access to sanitary pads. The campaign, which demands the provision of free sanitary pads across Wits campuses, relaunched on August 7 with pad donation boxes being placed across Wits main campus. Last year’s the campaign was interrupted by the start of the #FeesMustFall protests. According to Wits Amnesty International chairperson, Raees Noorbhai, this year’s campaign will involve various organisations, such as the Law Students’ Council and the non-profit organisation, Dignity Dreams. “What we are trying to do is build a coalition on campus of all the organisations that are pushing this issue, to come together and jointly push the demands. We want to come together and put political pressure on the university…and that’s what the coalition primarily will do,” said Noorbhai. Third year BA student, Yolanda Mbedzi, echoed Noorbhai’s sentiments. “The university should fund it because they already take up so much of our money, but I haven’t seen them use the money for anything good or beneficial for us as students, so the least they could do is fund something as important as pads,” she said. Wits Vice-Chancellor Adam Habib told Wits Vuvuzela that the university is currently unable to afford free sanitary pads. “I think that if there is a demand for free sanitary pads, then it is a legitimate demand and it should be directed to the state. What you can’t do is make Jacob Zuma’s responsibility Adam Habib’s responsibility, that’s inappropriate,” said Habib. According to Noorbhai, the campaign will continue indefinitely, until free sanitary pads have been secured across Wits for both workers and students.